try this if you are having trouble prioritising…..
She has tried the more usual managerial methods of ***’s, numbering and even the grid urgent/important, not urgent/ important, urgent/ not important and not urgent/not important to little effect. Imagine a container in front of you. Now fill it with rocks. Is it full? Maybe. It does seem so but try fitting in some pebbles. Sure enough you can get quite a few in there as well. NOW is it full? Yes, it seems so. What about if you add some sand to the container? Sure enough there is a bit more room. Must be full now. No! Still room for some water. But what happens if you try to work in the reverse and fill up the container with water and sand first – you probably won’t get many pebbles or rocks in at all. In this story the water and sand signify the little things that fill our time up while the rocks and pebbles signify the big important stuff of life. And the moral of the story is obviously if you always try to fit in the water and sand first, there will never be room for the pebbles and rocks. What a great visual that is, I can almost feel that container and how much I could fill it with each of those substances. How about instead of trying to determine if a task was important, urgent, not important, not urgent (all the nuances of that make my brain hurt…) or even trying to figure out if it is a 1, 2 or 3, or even a *, ** or ******* we just assigned a R, P, or S to it. We thought it was brilliant. 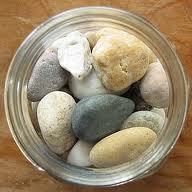 I immediately reassigned my to-do list as Rock things, Pebble things and Sand stuff. I left out the water. It happens anyway. And it felt immediately easier. Love the visual. I use Toffee Apples, Marshmallows and hundreds and thousands (topped off of course with lemonade instead of water)! It works particularly well for me as it’s not just a visual – I actually prefer toffee apples, with marshmallows second and hundreds and thousands last if given a choice of what to eat. So tasty and time saving!